But first, let’s make matters complicated. I’ve sewed lots of button-up shirts on this blog, but I’m sad to say I still don’t have a TNT (tried ‘n true) shirt pattern. It’s not for lack of trying. My very first dress shirt, and the one I made to start this blog, McCall’s 2447, was great from the details standpoint but was billowy and blousy, especially in the sleeves. McCall’s 6044 made a springtime seersucker shirt, but the pattern is pretty basic (it has no back yoke piece, for instance). Kwik Sew 2000 is a nice “Sport Block” shirt that fit my partner Jim way better than it ever fit me. I thought McCall’s 6613 was promising, but this pattern turned out to annoy me in several ways – the biggest being the pattern draft added WAY too much ease to the sleeve caps. And though I wear the finished projects from this pattern, there’s something a little dowdy about the styling. The collars certainly look dated, but there’s something about the lines of the shirt that bug me. Perhaps this stems from it being a unisex pattern, I don’t know. At this point, I’m becoming disenchanted with the commercial patternmakers, at least as far as contemporary patterns go. 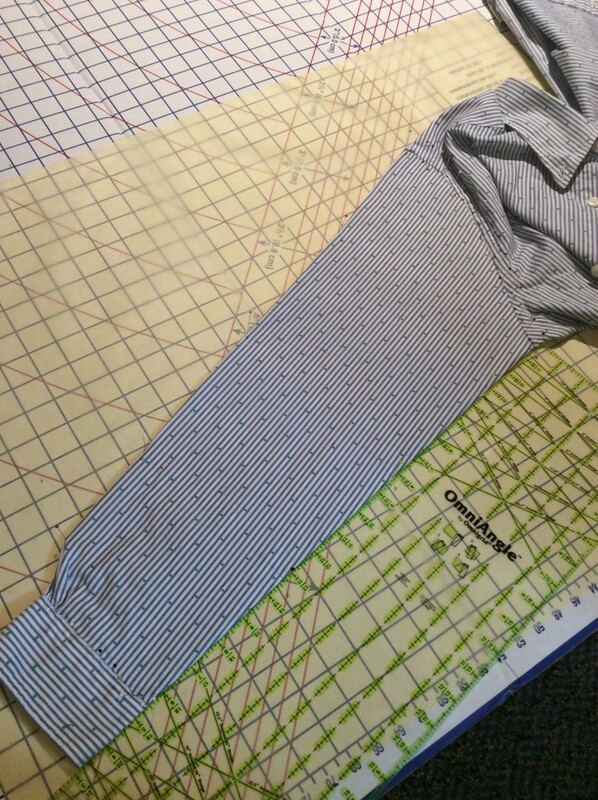 For this project, I’ve decided to clone a commercial shirt pattern, from a Famous American Shirt Maker, whose name I don’t want to reveal in print because I would rather not attract attention I am copying their pattern. The Famous Maker offers four distinct cuts for their shirts. I purchased two shirts for this project. 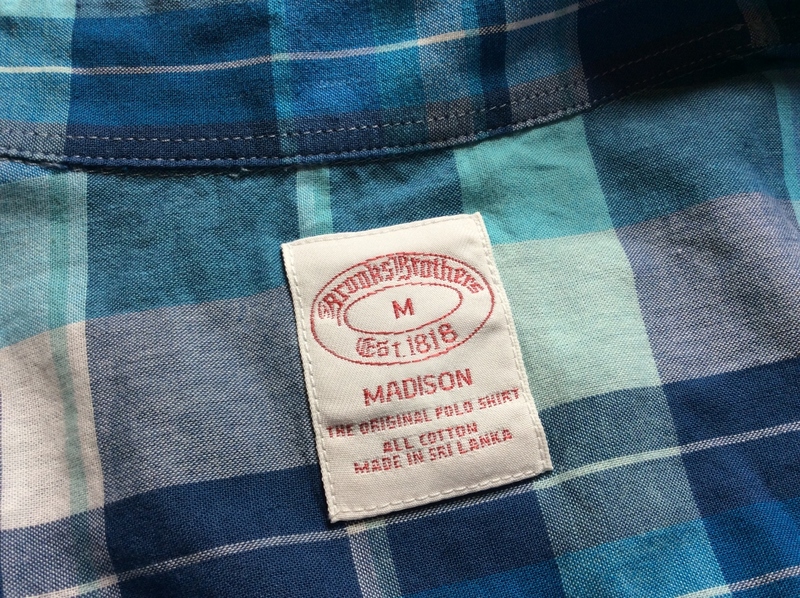 The “Madison” fit is described as the Famous Maker’s “Regular” fit. 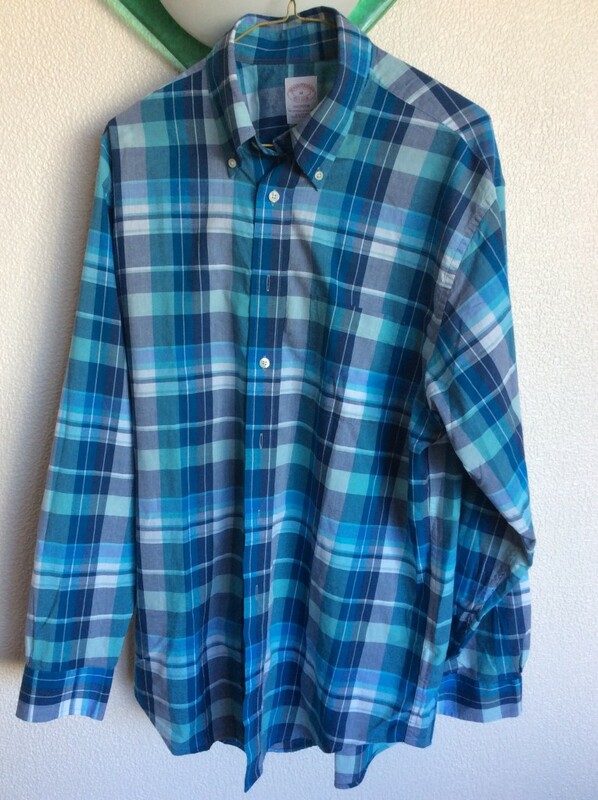 This blue Madras plaid is an example. And the “Regent” fit is their slim fit cut. Here’s the sample I purchased. I likely will go with the “Regent” fit for my holiday shirt. 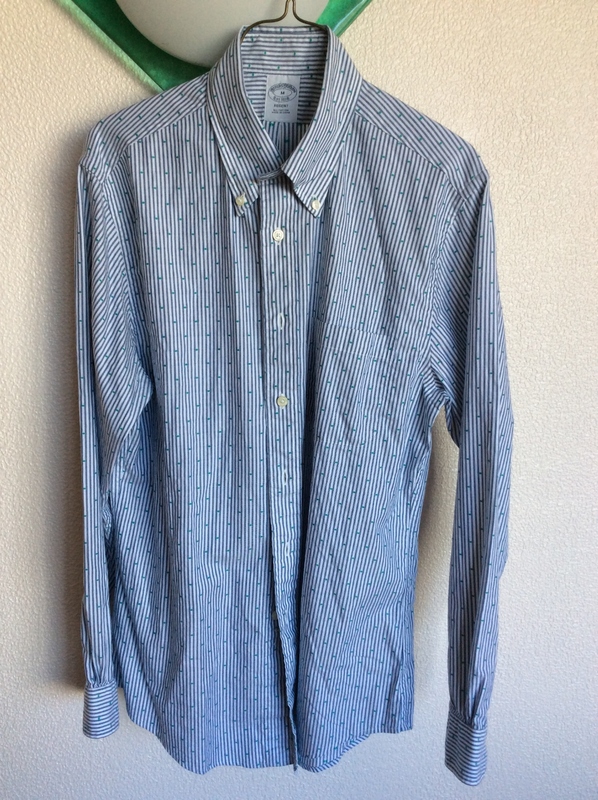 I followed (as usual) David Coffin’s instructions for copying a shirt pattern. He describes the technique in both his shirt books, Shirtmaking as well as The Shirtmaking Workbook. He also has produced a YouTube video illustrating the technique. Basically, you poke lots of holes with a pin at the seam lines, then connect them with a pencil and pattern drafting rule, or French curve. A big challenge came from the tracing paper I used, purchased from the art supply store. This paper is great for tracing patterns, but the pinholes I made in the paper were almost completely invisible. I had to poke lots more pinholes that I probably would have had to with some other kind of paper, and I had to turn up the light at the desk as I worked with paper and pencil. I would advise testing out the paper you use for pinhole visibility before trying out this method. Also, with the Regent shirt I sometimes ran into difficulty pinning pieces totally flat. Here, I ran into issues pinning near the back-armcsye-yoke intersection. The shirt wouldn’t let me get into that upper corner with the rest of the shirt back pinned down. I had to unpin most of the shirt to let me repin in that area before I could trace it out. The end result of this process was a stack of sheets of tracing paper containing front, back, sleeve, yoke, and collar pieces for both shirts. Traced on the seam lines, there are no seam allowances. Seamlines need to be walked and trued. Pleats, for example the box pleat in back, have been folded out for the trace. This trace will become a pattern block that will need a cuff draft, back pleats added, new front plackets, and optionally new hemlines. I stuck two-inch alignment squares all over them, for scanning, assembling and digitizing into Wild Ginger’s PatternMaster software. I’ll cover the differences between these patterns in detail in a future article, once they are digitized into Wild Ginger. But one thing I noticed during the copying process is the difference in sleeves. “Regent” fit has very straight sleeve seams. With “Madison” fit, the sleeve seam curves into the armscye. Presumably this offers a fuller sleeve. 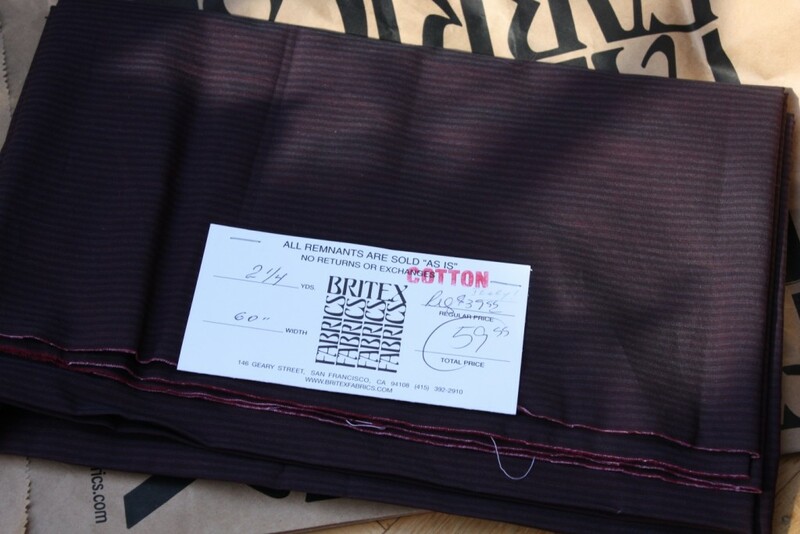 For the Holiday Shirt, I’m using a remnant of high-quality Italian-made shirting I got from Britex Fabrics. I purchased it during a 30% off sale, so I probably paid somewhere around $40 for this cut of fabric. I am very much looking forward to sewing with it. The matching buttons also come from Britex. 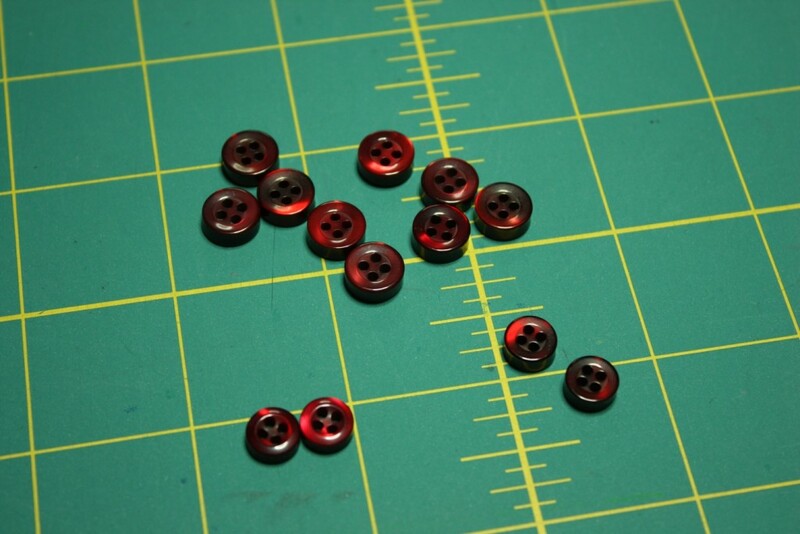 I have front placket, cuff, and collar buttons but I am not sure I am going to use the collar buttons in the finished shirt. We’ll see. I’ll get the pattern into the computer, and we might talk about fitting. I am far from an expert in making a template. I use a fine tracing wheel for difficult areas to trace, in addition to pins. Of course, it does help that i copy from a old piece. I am sure your method is proven effective. Great buttons. You can get creative when putting them on. I did consider using one of my “prickly” tracing wheels, but was concerned that it might be damaging to the fabric – more than poking with pins. Though I bought the shirts with an eye towards cloning them, I want to wear them too! You’re off on another journey! I’m sure you’ll get to the shirt of your dreams. And what’s with McCall’s and all the sleeve cap ease???? It drives me crazy too. Thank you for the encouragement, Duane. If my shirt turns out half as nice as your Halston Shacket I’ll consider it an overwhelming success! LUV, LUV, LUV Britex Fabrics!!!!!!! I know you like to figure things out yourself, but have you ever considered having a pattern made by a professional? You could continue to teach yourself, but in the interim you’d have a nice shirt that fit. I can’t help but note a bit of irony; if you followed my blog during my pants-fitting saga, several readers, with much more experience, were exhorting me to trace a pair of pants that fit rather than attempt the herculean task of fitting myself. The whole point of this project was to follow their advice. Both shirts, especially the Regent shirt, already fit me pretty well. They only need minor adjustments to fit better. You’re welcome. It can be hard to use a RTW piece if it doesn’t fit perfectly. The few times I’ve tried to copy things it’s been much harder than anticipated because of the fitting changes required. And I had help. I wouldn’t use the needle wheel on a new shirt either. You could try using Swedish Tracing Paper or silk organza and tracing the seams. Thank you for the warning. I’ll have more to say on the accuracy of the trace in my next blog article. A few notes about copying shirts. When I copy a shirt, the first thing I do is to carefully measure at all the crucial places, neck, shoulder, chest, waist and bottom widths; High Shoulder Point (HSP), back and front neck drop, and sleeve lengths. Also measurements of the collar, collar stand, cuffs, yoke, and any pockets. I do a straight draft on paper, but for novices, the DPC pin prick method will do for a rough draft. 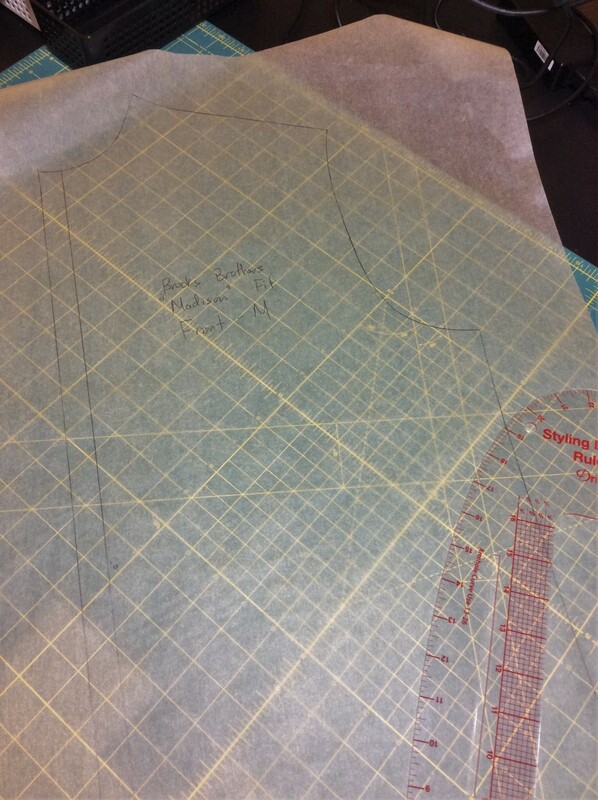 Those initial measurements will be needed to compare to the rough draft and the pattern will be trued up accordingly. Note that no man’s shirt needs ease in the sleeve cap, no matter what anyone tells you, a man’s shirt does not need sleeve cap ease, period. 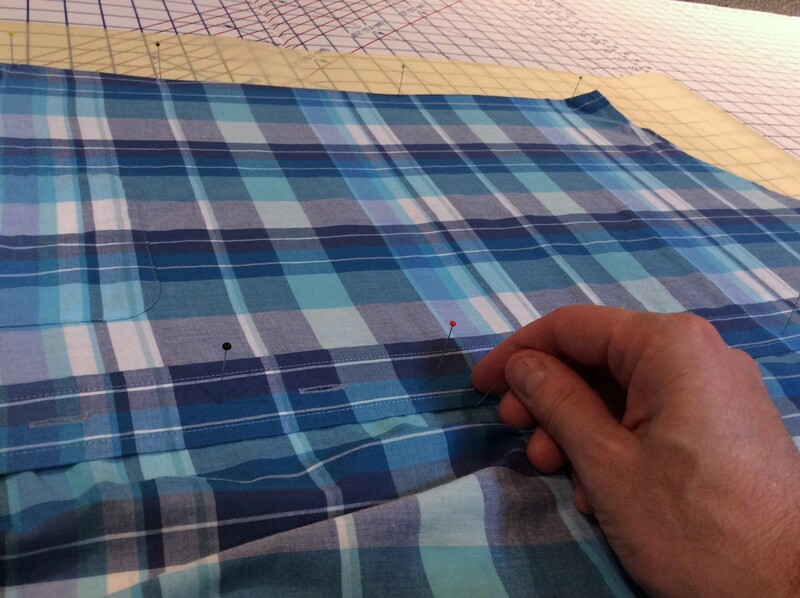 Try sewing a flat-felled sleeve cap seam with one inch of ease, impossible. Lastly, the part that always gives me trouble (I am a professional pattern maker, by the way?!?! ), is the end of the sleeve with the pleats, cuffs, plackets, how much width, space, ease, and blah, blah, blah….Just a lot of stuff to figure out at that point. There’s more stuff to figure out, but I anxiously wait to follow your journey! A short PS: in the clothing biz, the pattern paper of choice is called Alpha Numeric Marker Pattern Paper. This is the white translucent paper with light blue letters, symbols, and numbers printed on a 1″ grid. It’s used primarily for laying out markers, the grid making grain line matching quick and easy. It’s translucence makes for easy tracing, it’s crispness makes it good for pin pricks from tracing wheels or pins, and it has a good tooth suitable for numerous erasures. I buy it by the 60″ wide roll, but fabric shops will sell it in 5 yard increments. An excellent alternative, and in some ways a superior one, is plotting paper. Try reeling off a few yards from your company’s digital plotter and try it out at home! I bought a stray roll of it off Craigslist for $10 and couldn’t be happier with how good it is for apparel patterns. You’re right, even if the tracing is good, it’s still a ROUGH draft. Interesting to hear about your approach. I’ll try measuring the shirt to see how it compares with the pin-prick draft. Thank you for confirming that men’s shirts don’t need sleeve ease. McCall’s 6613 had well over two inches of ease along the sleeve cap if I remember correctly, and I had to alter the pattern to get rid of it. I got it down to around 1 inch, but if I had known I would have eliminated it all. I do agree it makes sewing a flat-felled seam along the sleeve-cap seem difficult; that’s been the least successful part of all my shirts so far. I’m also a bit perplexed by the end-of-sleeve styling. McCunn’s “How to Make Sewing Patterns” doesn’t have much to say on the subject, but I have other menswear patternmaking books to consult. Thank you for faithfully following my blog! You are right, depending on what type of paper you use, the pinholes can be very difficult to see when it comes time to trace them. Here’s a couple things I’ve figured out. For my first attempts at copying a shirt using the pin prick method, I used the same paper as you. I found that by lightly coloring over the pinholes with the side of a pencil led, I could make the holes “pop”, and thus easier to see. Although that works well, I also discovered that using different paper is an even better solution. I started using artist’ sketch paper – the tan colored paper that comes in a large pad – and found that worked very well. 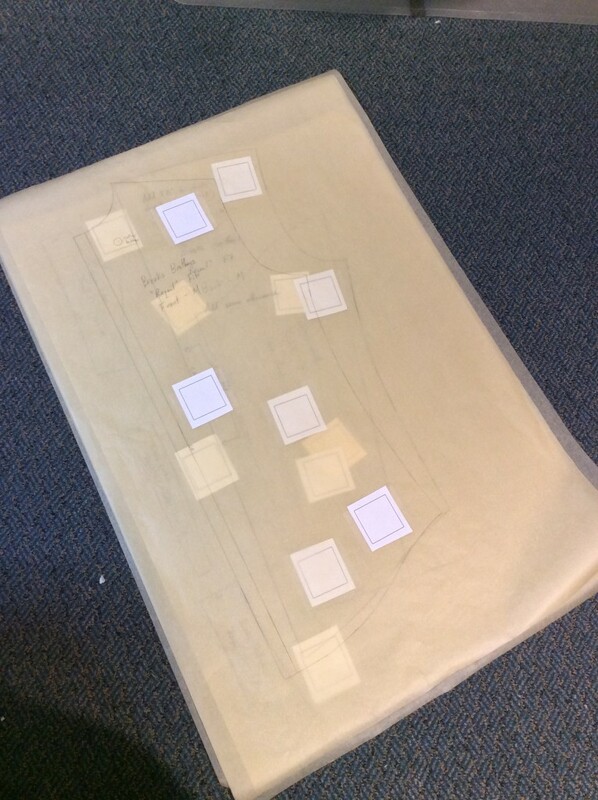 The only problem was that I’m rather tall so I usually had to tape two sheets together in order to have a piece of paper long enough to trace shirt fronts and backs. I then started using the artist’s paper that comes on a roll and that proved to be ideal. In the end, I found heavier paper seems to work best for this task…at least for me. 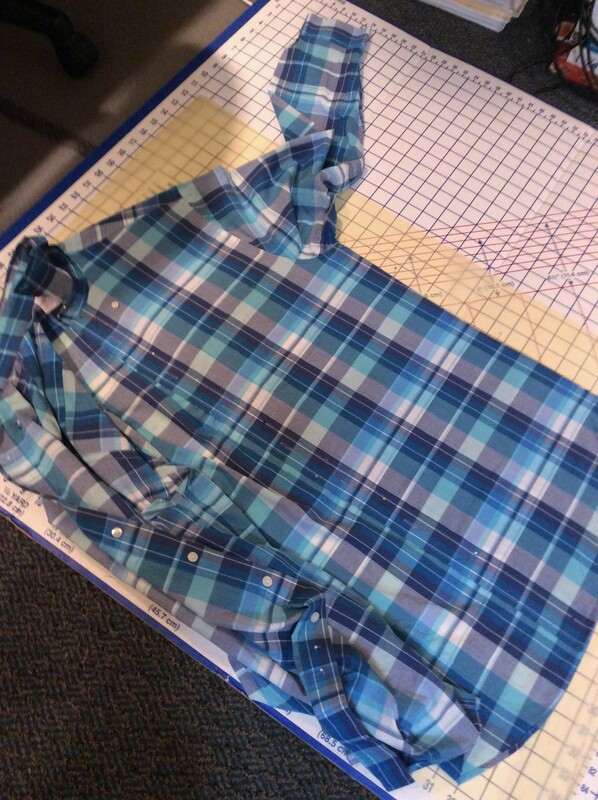 I’m happy to say that after several attempts, I do have what I now consider a near perfect shirt pattern. Obtaining it was a result of copying a shirt that I liked, then making several adjustments to the fit based on tips I gleaned from a couple of Craftsy.com fittining/pattern adjustment classes. I know from reading your blog (which I found from reading one of your posts on Craftsy) that you are a fan of the site so I’m surprised you haven’t tried that as well. It takes a bit of effort but it’s well worth the time. I couldn’t be happier. By the way, Mike Maldonado also has a video for sale on making adjustments to commercial patterns specifically for Men’s shirts. I’ve not seen it, but have purchased some of his other shirtmaking videos and they are excellent. Finally, Kenneth King has written a book on developing a sloper (of course there are others available too) . I’ve read it but have not made my own sloper…yet. It looks like a very good book though. You can find it on his website. That might also be a good route to try If you really want to develop the perfect pattern to fit your body. Good luck! Taking a pencil, lightly tracing over the path of holes and cleaning up with curves is basic pattern making. I am a fan of Craftsy, but I’m very picky when it comes to fitting instruction. Everyone has their own personal approach to fitting. My experience has been that when I try to combine aspects of everyone’s “expert” fitting approach, I get a mess as a result. That’s almost certainly because everyone’s method has different assumptions. It’s better to pick one and work with it, and work with it again. I have developed TNT button-up shirt patterns for both DH and DS. (In fact, separate TNTs for dress shirts, flannel shirts (looser cut), and short sleeve shirts – which I found required a different block.) Like you, I gave up on using sewing patterns and just copied RTW shirts…and THEN embarked on fitting, altering, and muslin after muslin after muslin. Did I mention that both of my guys have significant fitting issues? Oh, yeah, they do. Once the TNT is nailed, though, it is So. Great. Buy fabric, sew it up, get big smile from shirt-wearing guy. 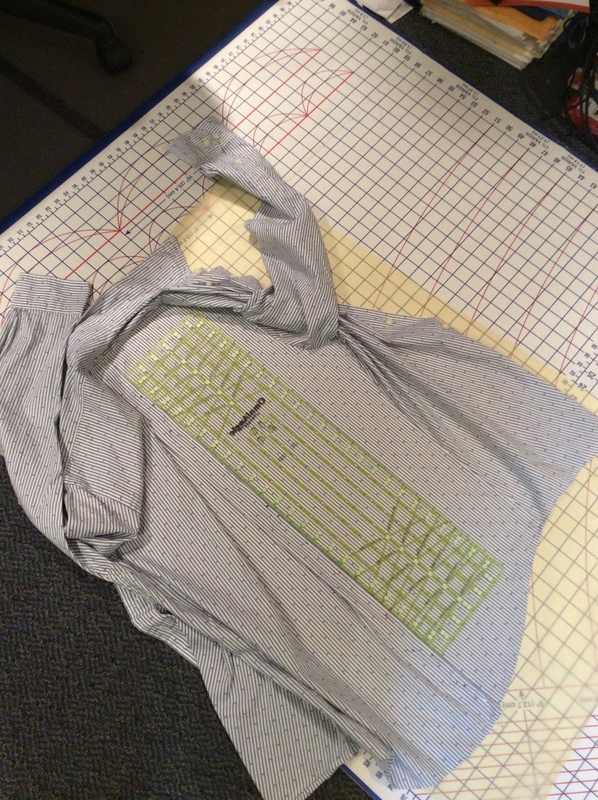 In the course of my shirt copying journey, I tried several methods, including the pin marking transfer method. What I now use is my fave tool: Glad Press-n-Seal plastic wrap. Simply press it firmly onto the shirt piece you are cloning, mark the seamlines (I use a Sharpie), lift it off, lay tracing tissue on top of the PnS, trace the outline, and there’s your pattern piece. (When laying down and lifting the PnS, it is important to not allow it to wrinkle.) 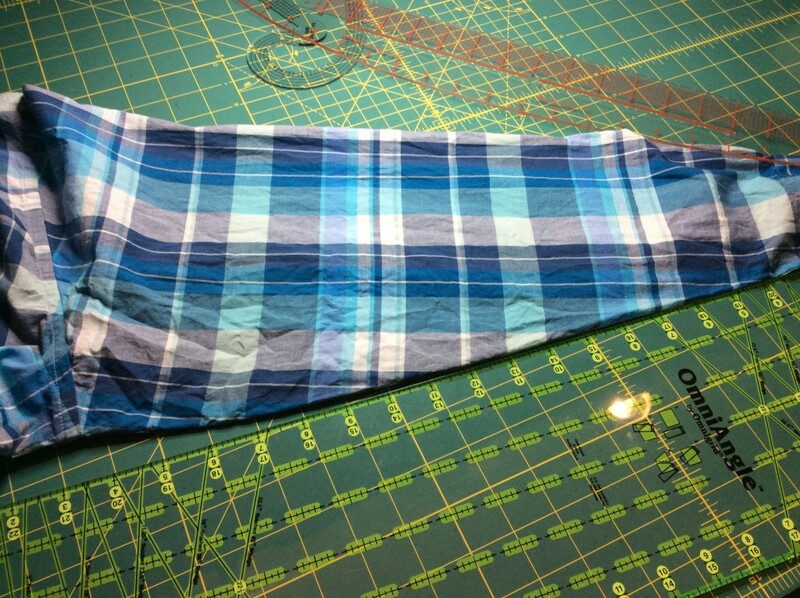 If your garment piece is wider than the PnS, it is easy to adhere another piece to add width. I find the PnS to be just as accurate and WAY faster than pin marking. Thanks for the Press-n-Seal suggestion! And thanks for clarifying that little curve in the armscye – it’s been a while since I’ve read DPC so I wasn’t aware of the cut-on gusset thing, but it makes perfect sense. FWIW, I saw the Press “N Seal method recommended on the Web a few years ago and asked Kenneth King, a home sewing expert whom many respect, about it. He was dubious, saying that it made more sense to use fabric to pick up the lines of a garment, I assume because it gives and behaves more like the source fabric. He uses silk organza. Other methods involving direct tracing (as opposed to pricking the seams to a surface below and tracing) I’ve learned have involved muslin. I imagine PNS picks up lines, but there will be more fitting. It also may work better on simple shirts. Hi Michael, sorry, I seem to have missed this post when it came out, can’t imagine why. Great stuff with lots of wonderful replies; you’re doing us all a great service with your thoughtful thoroughness and helpful readers, thanks. As for the sleeve shaping at the cuffs where the existing gathers or pleats distort the sleeve, I simply extend the center folded edge with a ruler, and eye-ball a smooth continuation as I extend the underarm seam to match the length I want. I assume I’ll be using one of my existing customized cuff patterns that are always smaller than any RTW I’ve worn or copied, and will either simply pleat or gather out the difference, or maybe redraw the underarm curve to bring it in a bit more for less gathering. I’m really most concerned with capturing the armscye shape, and assume I’ll be reverting back to existing underarm sleeve shapes from one of my TNT previous patterns, my favorite of which comes from an 80s McCalls pattern that has a lot of S-shaped contouring there, much more so than on either of your demoed shirts here. It’s always seemed reasonable to me that one could redraw those seams pretty freely, no matter what shape (or, more likely, NO shape) they start out with. Finally, much as I like “official” pattern maker’s dotted paper, I’ve been really happy with my decision a while ago to try out a flip-chart pad, which I can order easily from amazon, comes in a really useful big, flat cardboard box, good for laying under the paper when pinning through the shirt, and both stores and transports really well compared to rolls; just another option to consider. I must admit, “real “tracing paper such as you went for never occurred to me, especially after basically hating working with commercial pattern tissues; yuk! Off to enjoy Part 2—HNY!